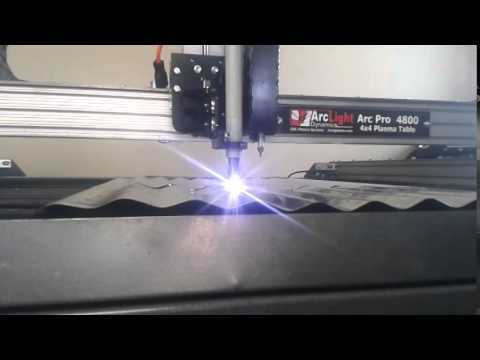 A high performance torch height control (THC) is essential to getting the most out of your CNC plasma table. This is why we have upgraded all of our Arclight Dynamics CNC plasma systems to give you the fastest THC available. Torch height control is essential to getting the highest cut quality and longest consumable life out of your CNC plasma and we feel that you can’t have a complete CNC plasma table without it. This feature allows unprecedented control of the cut, allowing the table to automatically speed up or slow down, while controlling the Torch Height Control. Automatically slow down on holes of various sizes, Improving cut quality and minimizing bevel. This alone makes the feature invaluable. Automatically set the table to slow down (or speed up) on Inside corners, Outside corners, Arcs, and many others features . Create custom “Path Rules Sets” that allow you to quickly apply multiple rules to cuts. This is one of the greatest features about our system and it really simplifies the operation of the table. Normally when a Plasma table comes to a sharp corner it will have to reduce the speed so it can change direction and this causes a change in the THC feedback voltage. This change can many tables to drop the torch down and hit the table. Our system Quickly detechs the speed change and toggles the torch height control on and off, preventing diving. This makes the system foolproof to operate. No other THC (ATHC; VTHC,etc) has the control, accuracy, adjustable features as our THC. Using advanced processor technology, the THC can be set to respond to cutting conditions that rival products costing thousands of dollars more. • 100% Digital Closed Loop Control. • Arc Volts Tracking within 1/4 volt. • On screen “Profiles” to let you set up automatic settings for any type of cutting. • Control the cut gap (tip volts) on the fly or from a preset. • Full THC features including CV tuning, response profile, head lock, and anti-corner dive settings. • All Parameters are displayed and set from our custom screen menus. You have total control over the way the THC responds and cuts. NO KNOBS to twist! • Exclusive self-test function allows instant checking of THC to PC communications and proper THC functions. • Two year warranty on all electronics. Unlimited lifetime support. For more information or questions about our Torch Height Control or our plasma cutters call us at 1-866-222-2154 or email us at Sales@arclightcnc.com.